A common misperception is that your California juvenile criminal record automatically gets sealed when you turn 18. The only way your juvenile record will be sealed is if you take the appropriate actions to seal your record. This also means that if you have a juvenile record this information will be visible on any background check conducted until you take the action to seal your juvenile record. With over 80% of employers conducting background checks today, why would you want to put yourself at a disadvantage in this tough job market? Once we seal your juvenile record it is like it never existed. If any of the involved law enforcement agencies are contacted regarding your juvenile record they must reply that "they have no record of the matter." All the details of your juvenile offenses will also be deleted from the national databases used for background checks. Lastly you will be able to honestly state that you have never been adjudicated or arrested. The process of sealing your juvenile record truly lets you put your youthful mistakes behind you. Our law firm specializes in juvenile record sealing in the state of California, and we pride ourselves on producing consistent positive outcomes for our clients. No two cases are exactly the same, and it is important that the attorney you hire spends the time to understand the unique details of your situation. We specialize in focusing in on the unique facts in your juvenile record sealing case, allowing us to craft the strongest arguments possible for the court. This unique tailored approach gives us the best chance at getting you a successful outcome in your juvenile record sealing case, and has allowed us to win over 98% of our cases overall. Why would you settle for anything less? We have successfully won thousands of criminal expungement cases for our clients in the state of California, and we take great pride in providing top notch customer service throughout the process. We have an A+ rating with the BBB, and have an established reputation for stellar customer service (Yelp - 5 Stars, TrustPilot - 5 Stars, TrustLink - 5 Stars). 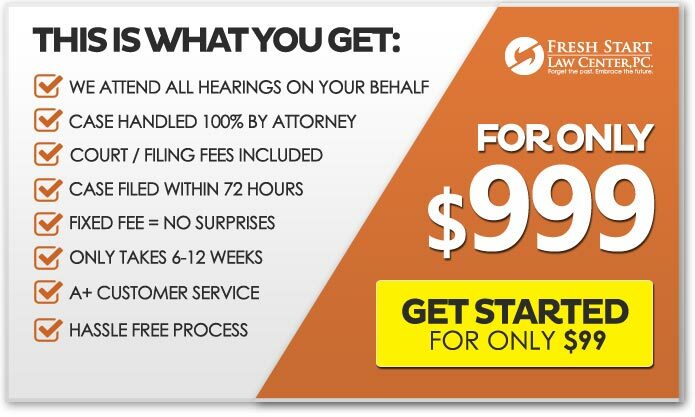 Beware of any law firm that has hidden fees (example: processing fees, hearing fees, etc.). We are one of the only criminal expungement law firms that offers fixed low pricing, meaning everything is included in our pricing. There will never be any hidden fees, games or suprises down the road with us. Our single low price covers everything from start to finish, period. NO HIDDEN FEES ever. The thing about hidden fees, is they seem to just keep popping up. All criminal databases used for employment background checks, both private and public, will update automatically within 30 days after the expungement is complete. You should never pay a company, or a law firm, for any service that claims to "expedite" this updating process. Learn the truth, and avoid scams here. The California legislature has specifically addressed your right to put your juvenile mistakes behind you for good with California Welfare and Institutions Code 781. Under WIC 781 we are able to petition the juvenile court to permanently seal your juvenile record. Once we file the petition with the juvenile court, the judge will set a hearing date. At the hearing, the judge will review our petition and any evidence presented by us, the local county's Department of Probation, the District Attorney, or any other agency that has relevant information pertaining to your juvenile record. The judge has the discretion to grant the motion, and will base his decision on many factors, the most important being whether he feels you have been rehabilitated. In other words, he needs to believe that sealing your record will have a positive effect on your adult life and that it is in the interest of society to do so. If the judge grants the petition your record will be officially sealed and will essentially cease to exist. This means that all activity associated with the juvenile record will be erased from the national databases used by private employers for background checks. All involved agencies are required to respond to any inquiries regarding your juvenile record with "we have no record of that matter." You will also be able to legally say that you have never been arrested. Having your juvenile record sealed in California will undoubtedly make you a more marketable employee candidate in this down economy with the tough job market, as over 80% employers today conduct background checks. 1You were not sent to the California Division of Juvenile Justice (DJJ) (formerly known as the California Youth Authority (CYA), commonly referred to as Juvenile Hall or Juvie). If you were sent to the Juvenile Hall you may be eligible for our juvenile record set aside service. 2You are 18 years or older now OR the jurisdiction of the juvenile court terminated at least five years ago (whichever comes first). 4Your juvenile case was not heard in adult court, and you were not convicted in adult court. However, if your juvenile offense resulted in an adult conviction we may be able to expunge that adult conviction with our other expungement services. 5You cannot have been convicted of a crime of moral turpitude as an adult, which are offenses that are intuitively wrong or dishonest. Examples include: theft, violent crimes, drug related crimes, etc. Examples of crimes not considered crimes of moral turpitude include: DUI, trespassing, drunk in public, regulatory offenses, etc. Learn more about crimes of moral turpitude. 6There is no pending civil litigation arising from any of your juvenile incidents. We are one of the few firms that specialize in juvenile record sealing in California. From the second you sign up with us an experienced and knowledgeable attorney will be dedicated to getting you the best possible outcome. We will use our expertise to draft a concise and persuasive petition to the court which will include all appropriate evidentiary support. We will also attend all hearings, wherein we will passionately argue your case on your behalf. We handle everything for you from start to finish, and we offer the absolute lowest fixed price anywhere (we guarantee that our price is the lowest). The average juvenile record sealing case will take 2-6 months in California, and will depend on on how backed up the court is at the time we file the petition. We deeply pride ourselves in our ability to help our clients to forget their past so that they can embrace the future. Don't wait any longer, get a fresh start on life today! 1You juvenile record will be completely sealed, meaning that it will essentially cease to exist. 2Your juvenile record will not be displayed on any background checks. 3All involved law enforcement agencies will be forced to answer all inquiries regarding your juvenile record with "we have no record of that matter." 4You can truthfully and legally answer "NO" on private sector job applications when asked if you have ever been arrested or convicted of a crime. 5You can greatly increase your earning capacity by becoming eligible for more employment opportunities. 7You can become eligible for better student loans. 8You can become eligible for better housing assistance. 9You can tell friends and family that you have not been arrested or convicted of a crime. 10You have the satisfaction of forgetting the past for good and moving forward into a more positive future. Isn't it time you put the past behind you for good, allowing you to concentrate on a productive future for you and your family? Get started today and get the fresh start you deserve. Hiring an experienced attorney is critical for your juvenile record sealing case. Having an attorney that understands the juvenile courts and intricacies of WIC 781 will greatly increase your chance of successfully getting your juvenile record sealed. A knowledgeable attorney will apply the applicable laws to the unique details of your case and will use your distinct facts to demonstrate to the judge, and any opposing parties, the virtues in granting your WIC 781 petition. It is important that you have a knowledgeable ally in attendance at your hearings, who knows how to handle the specific legal procedures of juvenile court and who is comfortable responding to any opposition, written and/or oral, that might exist. We are experts in juvenile record sealing in California. Our entire practice is focused on California record clearing laws. Our knowledge and experience allows us to provide you with ultra focused legal representation that optimizes your probability of getting the WIC 781 petition granted and your juvenile record sealed for good. We pride ourselves on being there for you every step of the way, answering any questions you might have, and providing professional, knowledgeable, and friendly juvenile record sealing legal services. From the second you sign up a knowledgeable and experienced attorney will begin working on your case, and we will be there for you every step of the way, addressing any concern you might have. We are known for our high standard of customer service, and we fully understand how important it is for you to get your juvenile record sealed. We only focus on record clearing laws in California, which allows us to not only provide specialized a juvenile record sealing service, but to also provide that service at the lowest fixed price anywhere (we guarantee the lowest price). We greatly appreciate you taking the time to browse our website and we hope that you found the information useful. We truly looking forward to helping you seal your juvenile record so that you can finally forget the past and embrace the future.